Editor's note: Country music star Brad Paisley was asked to participate in the White House Music Series on July 21. Exclusively for CNN.com, Paisley blogged about performing in the historic East Room before the president, the first lady, students, White House staff and members of Congress. 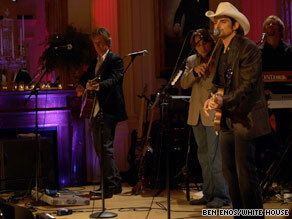 Country music star Brad Paisley performs at the White House in front of the president and members of Congress. WASHINGTON (CNN) -- I've been to the White House five or six times over the years, but none of those times did I ever pick up an instrument. It was always for some event. "Hey, there's a reception. Come eat some finger foods, and look around and be in awe like everybody else." But this time, the phone call was essentially, "We would like to know if Brad would be interested in performing at the White House in the East Room." It was as simple as that. It's like, "Yes! More than yes. I'm floored. Why?!" And I could never get the answer why. They just wanted me to play. Ironically, I read this story just last week on CNN about Michelle Obama's great-great grandfather, Jim Robinson, who was a slave in South Carolina. It's insane to think about that. How the world has changed. On November 4th, I felt an emotion like I haven't felt in my entire life. I think whoever you voted for, you had to be moved. My grandfather was in the Philippines fighting against the Japanese during World War II -- and now I record for Sony and played Japan twice on tour, and loved every minute. If you'd go back in time and tell my grandfather during air raid sirens, "Hang on there. Your grandson -- they're gonna love him," he never would have believed it. On Tuesday night, I got to perform four songs, and I looked down at the president -- who was sitting about 10 feet away from me at the time -- and I said, "I think about my kids and this generation, and you are the first president they're going to remember." I got to say that to him. And he just nodded and sort of closed his eyes. And I said, "So this is a song for our times. It's called 'Welcome to the Future.' "
The last verse is about a kid in high school who's having a difficult time, and who's black, and he has a cross burned in his yard for asking out the homecoming queen. And the line of the chorus is, "Wake up Martin Luther, welcome to the future." The last words that I sang were, "Glory, glory hallelujah, welcome to the future," and then I left and went offstage. I took my hat and tipped it to him and said, "Thank you, sir." And then I came off and just started bawling, because it was so emotional for me to sing those words. He came to me and said, "If I could sing like you," which was really cool. And then he sort of looked me in the eye and he said, "Wonderful, wonderful words." And I said, "Thank you, sir. I meant them." Being able to deliver that message personally to one of the people who ushered in this new era is really one of the most completely, artistically satisfying moments I've ever had. I don't think he knows that much about country music, but that's OK. We're talking about a guy born in Hawaii who lived in Chicago, so I don't know if he's been exposed to it much. His aides said he told them he was going to download my stuff, which was really cool. I don't know if he will, but I hope he remembers to do that. I could make him a playlist, if he'd like. I'm lucky that my current album, "American Saturday Night," has a couple of songs about being alive in these times -- that are about our country and are semi-patriotic. Because you know me -- up 'til this time, I've sung about beer, fishing, love and searching for ticks. You can't go anywhere in the White House without them taking your picture -- probably without your even knowing it. I hope that's the case. I want to think they're watching you in there. But maybe they just don't care about napkins and ashtrays, because they certainly didn't say anything when we walked out with them! My wife did get a couple of towels -- not the hand towels, but the paper towels that are stamped with the seal -- she got a couple of those. Everybody's a groupie in the White House. Everybody! I think if George Bush went back to visit, he go, "Hmm. Let me take some of these napkins." There's something about the White House. You've got to have swag from there if you can get it.